FLT has been bolstering their management team quite a bit of late. Duncan Card, BA, LLB, LLM, ICD.D, has agreed to join Drone Delivery Canada Corp.'s advisory board. Mr. Card is a Senior Partner at the prestigious Canadian law firm of Bennett Jones LLP, where he Co-Chairs the Technology Law practice and Chairs its Government Contracting, Procurement and Intelligent Infrastructure practices from that firm's Toronto and Ottawa offices. The National Post, includes Duncan in its recently published 2019 rankings, "Best Lawyers in Canada" (Technology Law). The 2019 Canadian Legal Lexpert rankings, based on peer reviews, has included Duncan as one of Canada's leading lawyers in both Computer Law and Technology Law for the last 15 years. In 2018, Duncan was also named by Lexpert Magazine and Canadian Council For Public-Private Sector Partnerships as one of Canada's leading infrastructure lawyers. Duncan brings to Drone Delivery a wealth of experience and expertise concerning complex, innovative and strategic commercial transactions, including technology driven infrastructure solutions, defense and national security matters, logistics and supply-chain management, and the commercialization of transformative technologies, as well as the development of business strategies to drive revenue generation and commercial growth. "I am extremely pleased and honored to join Drone Delivery Canada's Advisory Board, where I look forward to participating in the company's continued revenue development, aggressive commercialization strategies and expedited market success", said Mr. Card. Mr. Card will begin his Advisory Board activities on March 27, 2019. Now we know why the stock has been down here. TORONTO, March 6, 2019 /CNW/ - Drone Delivery Canada Corp. (TSX.V:FLT – OTCQB: TAKOF) ("Drone Delivery" or the "Corporation") announced today that it has entered into an agreement with GMP Securities L.P. (the "Underwriter"), pursuant to which the Underwriter has agreed to purchase, on a bought deal basis pursuant to the filing of a short form prospectus, 6,000,000 units (the "Units") of the Corporation at a price of $1.20 per Unit (the "Offering Price") for aggregate gross proceeds to Drone Delivery of $7,200,000 (the "Offering"). Each unit shall consist of one common share and one half common share purchase warrant (a "Warrant"), with each Warrant entitling the holder to purchase one common share at a price of $1.50 until 24 months after the Closing Date. 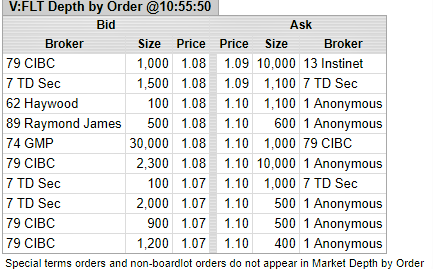 If the volume weighted average price of the Common Shares on the TSXV is equal to or greater than $2.00 for a period of 10 consecutive trading days then the Company may anytime thereafter accelerate the expiry date of the Warrants to the date that is 30 days following the date on which the Company issues notice to all the Warrant holders of the new expiry date. The Company will also issue a press release on the same date as it issues notice confirming the new expiry date of the Warrants. I know FLT in the U.S. testing as well, wonder where they are in this? Here is a pic of the Condor. Getting very close to transporting people. Needs a windshield and wiper. 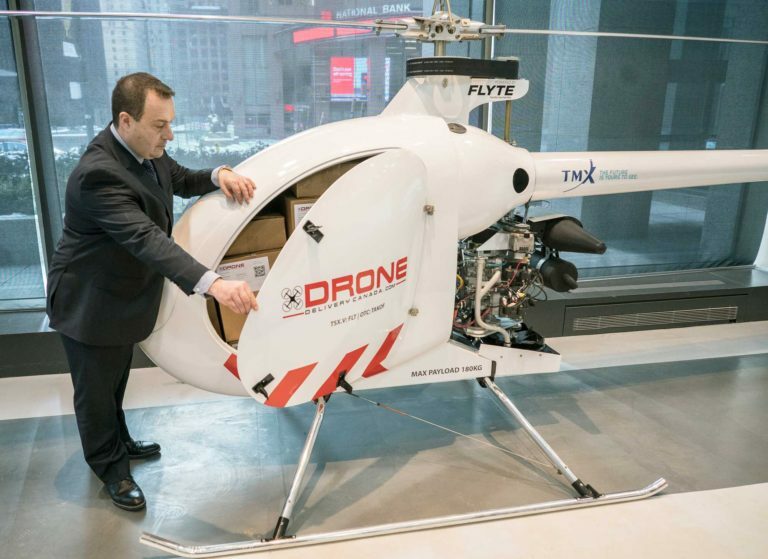 TORONTO, Feb. 19, 2019 /CNW/ - Drone Delivery Canada 'DDC or the Company' (TSX.V:FLT, OTC: TAKOF), today unveiled its largest cargo and farthest range delivery drone, 'The Condor'. 'The Condor' was displayed at public and investor launch events at the TMX Broadcast Centre Gallery in Toronto. The Condor has been in development for the past year and is the next generation in DDC's drone delivery cargo aircraft. With a payload capacity of 180 kilograms or 400 pounds, and a potential travel distance of up to 200 kilometres, the Condor pushes the limits in both cargo capacity and distances. The Condor is powered by a next generation gas propulsion engine. The Condor measures 22 feet long, 5.1 feet wide and seven feet tall. It has a wing span of approximately 20 feet and is capable of vertical take off and landing. It is equipped with DDC's proprietary FLYTE management system which is the same platform used in all of DDC's cargo delivery drones. This is also the same management system that was used in the fall of 2018, during the company's operations in Moosonee and Moose Factory, Ontario in support of Transport Canada's Beyond Visual Line-of-Sight (BVLOS) pilot project.